It is 14 July 1997, and time for the series premiere of Roar. In the year 400, young Irish rebel Conor (Heath Ledger) survives the massacre of his family before rising up to become the leader destined to rid his country of the Roman invaders. With the aid of his bodyguard Fergus (John Saint Ryan), former slave Catlin (Vera Farmiga), and African runaway Tully (Alonzo Greer), Conor starts with the rival chieftan who murdered his family and lover and who sided with the Roman during their invasion. Roar is one of the most mid-1990s TV dramas you could find. 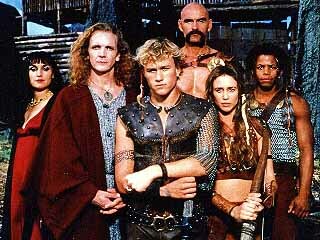 Following the runaway success of the linked fantasy series Xena: Warrior Princess and Hercules: The Legendary Journeys, American TV networks and syndicates briefly went spare trying to recapture the appeal of those shows. To my mind Roar is the most accomplished of those attempts - albeit one of the more short-lived at just 13 episodes. It's an engaging remix of other programs, produced with a lot of enthusiasm and good humour. The series was created by Ron Koslow and Shaun Cassidy. Koslow was a respectable writer and creator of the popular 1980s TV drama Beauty and the Beast. Cassidy was a former teen actor who, once producing TV drama, always pitched ambitiously if not wisely. His career is littered with noble failures like Roar, American Gothic and Invasion; series that were well made but lacked mainstream appeal. To be honest it makes him the sort of producer I like the most: he may not have had too much long-term success, but he has always made the sorts of shows he has wanted to see. In their hands Roar is targeted at that Hercules/Xena market, but in terms of narrative it is one part Mel Gibson's Braveheart and one part Robin of Sherwood. It is an eye-catching blend, and despite a fairly simplistic story each week it is packed with interesting concepts and ideas. One of the most potent is Longinus (Sebastian Roche), the shadowy adviser to Roman commander Diana (Lisa Zane). He is the Longinus who, as a Roman centurion, stabbed Christ on the cross with a spear and earned immortality as a punishment. Roche plays him very well, and when he appears in his true withered form he looks rather effective. There is some immediate fun to be had watching early career performances by Vera Farmiga and the late Heath Ledger. Co-stars John Saint Ryan and Alonzo Greer sadly did not share in their subsequent fortune. There is a fair bit of overly earnest acting going on throughout, but it does have a spark to it - particularly when it comes to Ryan and Ledger's verbal sparring. It is all, as noted above, very much of its time. There is some strong cinematography during the episode, and a very well staged battle sequence at the climax. Jon Erlich's musical score goes heavy on the Celtic influence but works very well. Altogether it is a very enjoyable pilot episode, and while it has all dated terribly and tends to feel rather corny from time to time, Roar's "Pilot" is a lot of fun. It's a pity audiences of the time didn't quite feel the same way.